You are in for a very special treat, today we have Karolyn from The Relished Roost sharing her gorgeous home. I am totally in love with this place and would move in instantly if given the chance. You will find that Karolyn is not only adorable, beautiful and charming, but her home is breathtaking. She is an Interior Designer who just returned from Ireland and collects things for her clients from around the world. 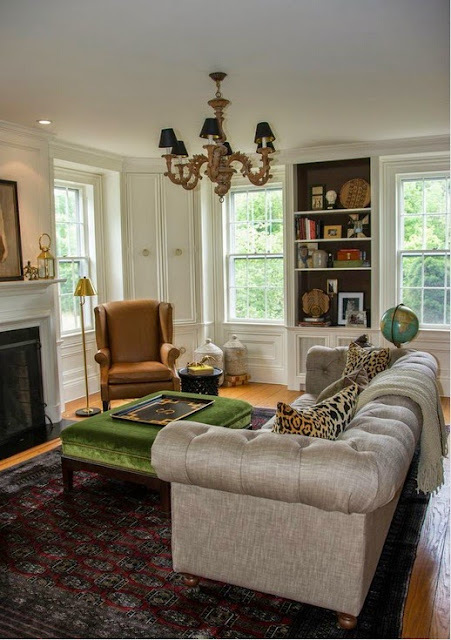 Her home definitely displays her style and love of classic design. Can you tell she has totally captivated me? 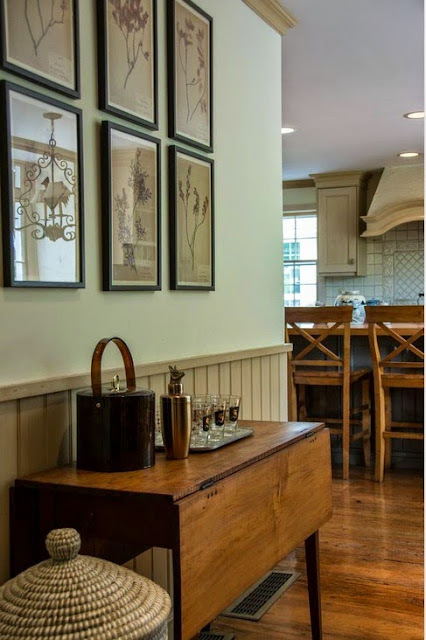 I am honored to be part of Marty's post on house tours today! 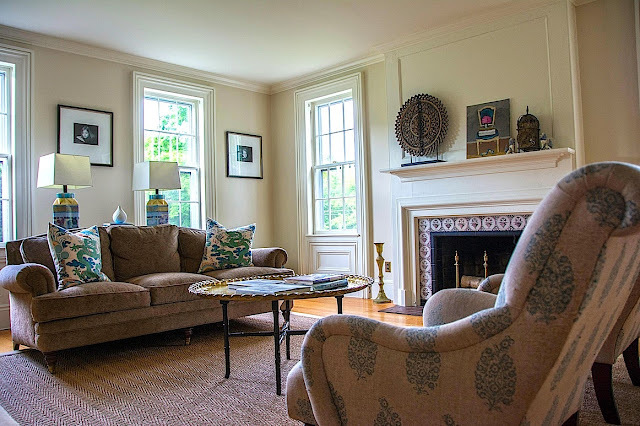 I hope I don't disappoint her readers as my house is a bit more on the eclectic traditional side and not the fun trendy chic side that we are often seeing today. 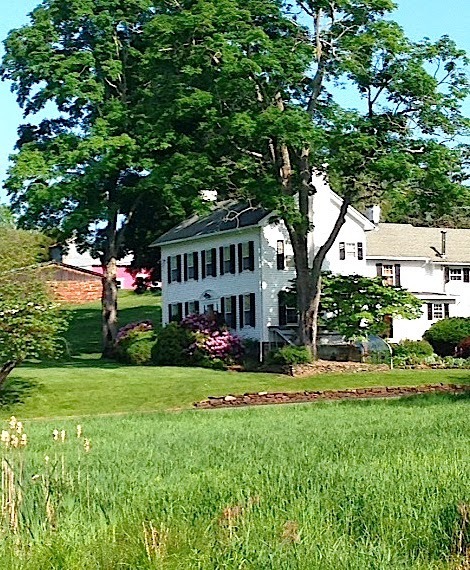 The old homestead is from the 1770's and is a center hall colonial farm house. We live in rural New Jersey but are still only 45 minutes from New York and 30 minutes from Pennsylvania. It has been a 14 year work in progress that never seems to end. We will be revamping the kitchen and butlers pantry in the Fall and I am currently painting a mural in our powder room. Hope you enjoy the tour! Are you as captivated as I am.. Her home is so beautiful, there is no need for commentary, you can see how carefully she has chosen every item and paid such attention to every single detail. Now you definitely don't want to miss one single post, they are all full of tons of inspiration. So if you don't follow her already, rush over and click that follow button. Thanks so much Karolyn for letting me show you off and brag about you. I adore you home and your style. If you would like to be featured, just leave me a comment or email me at astrollthrulife@live.com. Well, we are the biggest fans of Karolyn, and I don't know how we have missed her home - it is GORGEOUS!! 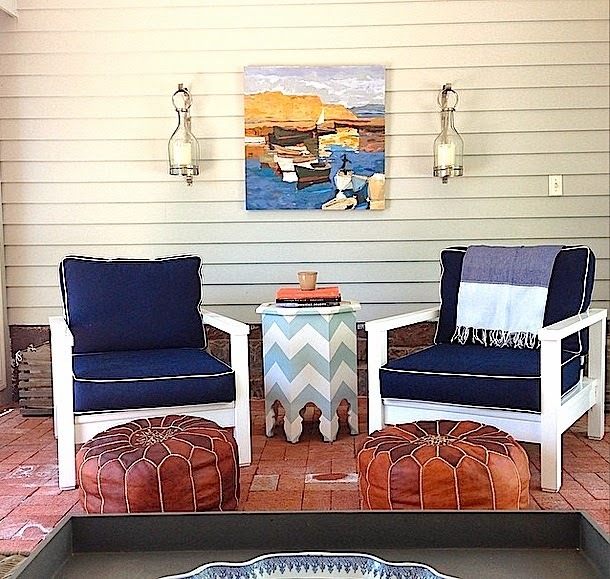 Love the warm and inviting feel and outdoor area…fabulous!! Wow this is one beautiful home!! Somehow I am not surprised as Karolyn has superb taste but what fun getting to see the whole enchilada:) Every single room is just magazine worthy.....thank you both for sharing! Thank you for taking the time to share this. I love everything specially the walls. Perfect colors I must say. No surprise that Karolyn's home is just as beautiful as she is. Such a talented designer with an eye for a well-lived life. Thanks for the tour! Beautiful! My favorite place to lounge would be the back patio or the pool. Love the french doors and that stone steps leading to the back yard/pool? Wow! 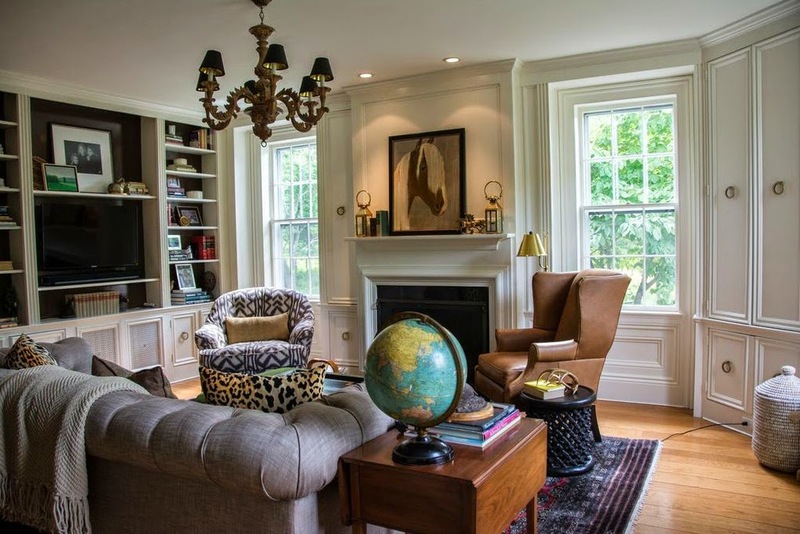 Karolyn's home is absolutely gorgeous! 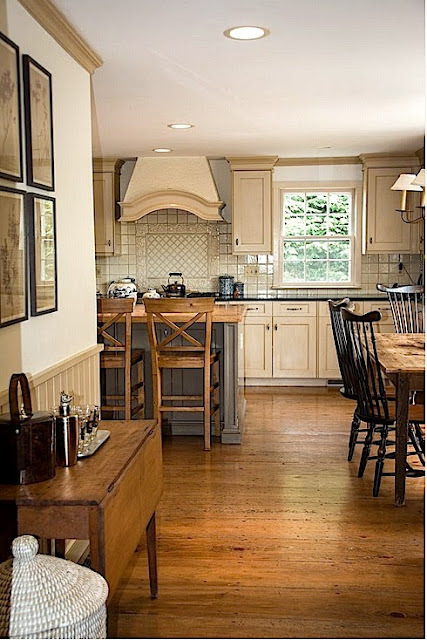 She has shown bits and pieces on her blog but I am thrilled to see more of her stunning home. It truly reflects the beautiful and classic style of Karolyn and her family! I am totally blown away - I had to go back through the post about five times to take it all in. Karolyn's home is stunning!!! Wow! Stunning is the word!! This house is dreamy and perfect! 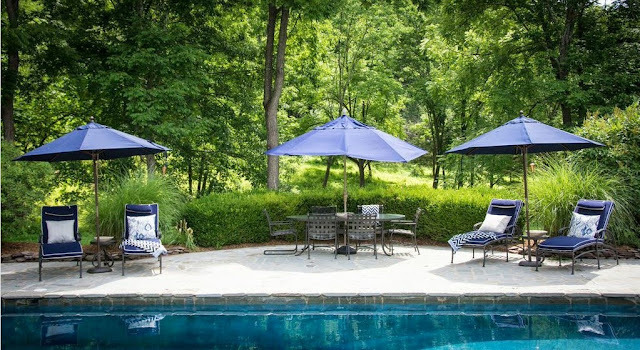 I can feel the love that has gone into curating every inch of this home, and am especially enchanted with the outdoor navy and white grouping on the brick. Is it a sun porch or completely out doors? I love Carolyn's style. I am so happy to see her whole house. Particularly love the family room, kitchen and pool house. Love the mix of old and new. I owe a thank you to Carolyn for introducing me to your blog!! Marty, what a gorgeous home! I love Carolyn's style! She has certainly turned this home into family friendly home and retained the elegance of a historic home. I love the outdoor spaces! 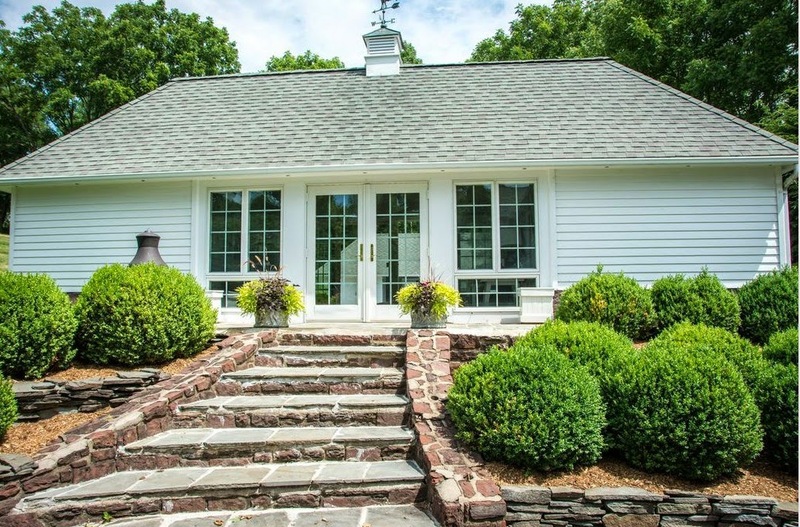 Thank you for sharing this fabulous home with us! Karolyn's home is GORGEOUS, I totally love it too Marty and would move immediately if it was mine, lol! 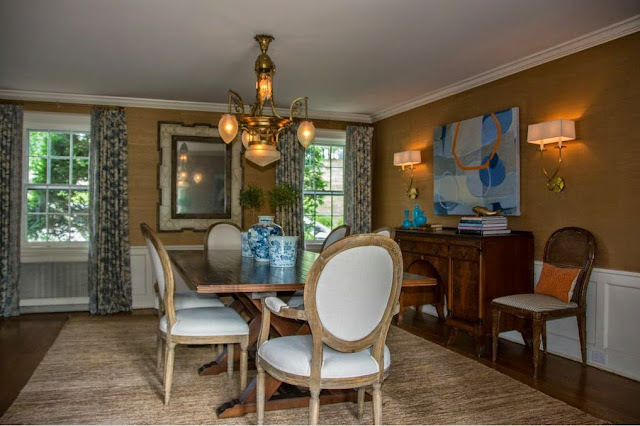 I absolutely adore this home for the reason that Karolyn stated. It is a home that has been collected and put together over time. Each room tells a story. You just cannot buy this at HomeGoods. Just beautiful! Thank you for sharing Marty! Gorgeous home, Marty. Thank you for sharing. I'm heading over to her blog to see more! Oh yes Marty, Karolyn need not apologize for her lack of following the trends of what the shabby chic industry has done for a lack of designs. I love her mix of traditional with the century olds, the tack room feel down to the sitting areas of relaxing in comfort. The pool side view and that land scraping is so lush with greens ...it allows her home to really stand out rather then just fitting in. Yes she is a beautiful lady inside and out I much like her many years of interior design work on gated clmmunities ( Estate Model Homes) res/ com work I can relate to many styles and the feeling of relishing in the fact that no two clients are going to be alike and that home designs is truly a style pleasing job. 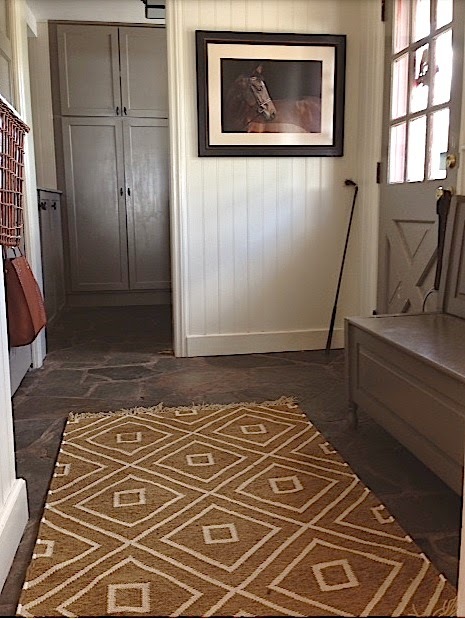 I would work with clients with high end furnishing all the way to cottage decor, myself breaking away from a power struggle with living in a home with the fear of not sitting any ware to now enjoying the love of salvaging pieces and creating a cottage home on pennies and showing ones the fun in it all. Karolyn, has a home anyone of us would jump at the chance of moving in, I hear you Marty with wanting to move right in. A beautiful weekend to you my dear, one that inspires all it offers. Beautiful home! I fell in love just from the outside view! Thank you, Marty, for sharing! Karolyn's home is absolutely gorgeous! Your home is so beautiful, and so warm and welcoming as well. You are so kind and helpful to include all the information and resource lists you provide, so I am a bit embarrassed to even ask this weird question: what kind of beverage bottles do you have in your bottle holder? They are the perfect size for a similar holder I have. Thank you! WOW!! I am in love too! What a gorgeous home and yes, you can see her attention to every detail. I could move in too!!! Thanks, Marty for introducing us to her. I am now following her blog too! 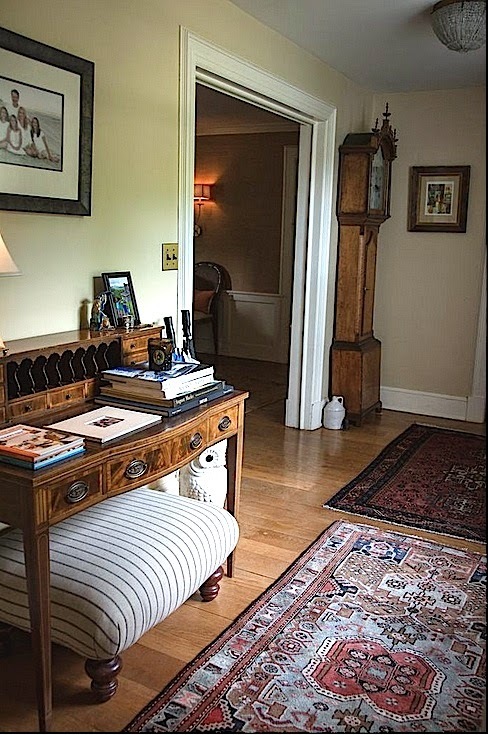 Oh Marty Karolyn's home is so pretty and so inviting. Love love her style. That backyard space is heavenly. Thanks for introducing her I am headed over to her blog now. 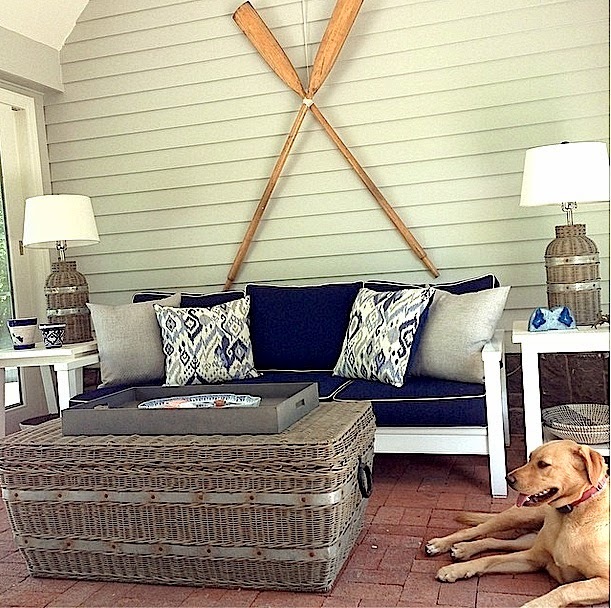 What a gorgeous home to feature Marty! Heading over to see more. Lovely home Marty. Such a nice visit, heading over to check out Karolyn's blog and see more. Your home is absolutely divine, yet still homey! Thanks for sharing! Wow...thanks so much for Sharing this with us...looking forward to following a new blog! In awe of this house...absolutely breath taking! Karolyn you did not disappoint, your home is beautiful! So swoon-worthy! I absolutely love that kitchen! Thanks for the tour.